The 2.2-liter engine was released in 1990 as the engine for new Subaru model - Legacy. The 1.8-liter engine EJ18 expanded the EJ family. The first was EJ22E engine. It is all USDM natural aspirated 2.2-liter engines from 1990 to 1996. The engine is four-cylinder boxer gasoline engine with the aluminum cylinder block and cast iron sleeves installed inside. It got SOHC aluminum heads and belt driven camshafts. The compression ratio of early EJ22 is 9.5:1. In 1997 the engine received some updates. There are solid lifters (the adjustment of the valve clearance is every 100,000 miles), the roller rocker cam follower system, single-port exhaust and 9.7:1 compression ratio. The primary target was the engine friction reduction to increase the power and reduced fuel consumption. The engine got pistons coated with molybdenum and reshaped. The weight of new pistons was decreased by approximately 100 grams. The intake manifold has been reshaped to increase the airflow mass and speed. 1996 was a transition year, and often EJ22E already was equipped with new parts from EJ22EZ (solid tappets or lifters for example). But the EJ22E like the EJ22EZ belongs to phase 1. The EJ222/EJ223 is from 99-01. The significant changes were in 1999. From this year 2.2-liter engine has the Phase 2 design and EZ stuff also. The main feature is new SOHC cylinder heads with the valves positioned at the more wide angle (the intake valves placed 23 degrees off-center, the exhaust valves - 20 degrees off-center) and the camshaft bolted to the cylinder head with the camshaft case. Let's pay attention to turbocharged versions of the EJ22. The EJ22T is 91-94 USDM Legacy Turbo engine. The power is 165 hp. It has SOHC aluminum cylinder heads, oil sprayer inside the block, fully closed deck and no intercooler. The EJ22G is JDM engine based on EJ20K STI engine. It shares DOHC cylinder heads and turbocharger with EJ20K but uses 2.2l cylinder block without oil sprayers to cool the pistons. There are forged pistons and stock connecting rods. Compression ratio is 8.0:1. Its power is 280 hp at 6000 rpm and 268 lb-ft of torque at 3200 rpm. This engine was built for Impreza STi 22B GC8 series. The EJ22 is probably the most reliable Subaru engine with a very bulletproof block. The engine life is more than 250,000-300,000 miles. 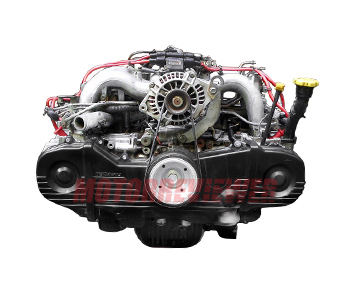 There are many cases when these engines run more than 500,000 miles mileage without serious problems.